Project "Teal Terror" is coming along well. After plenty of maintenance things, such as a full tune up, new Bestop soft top, and of course the 15" wheels with 235/75/15 BF Goodrich All-Terrain tires, it was time to add a lift. I ended up going with a 2" coil spring lift from BDS Suspension. This kit contains springs for each corner; new, longer rear shocks; strut extenders for the front struts; and a set of camber bolts. 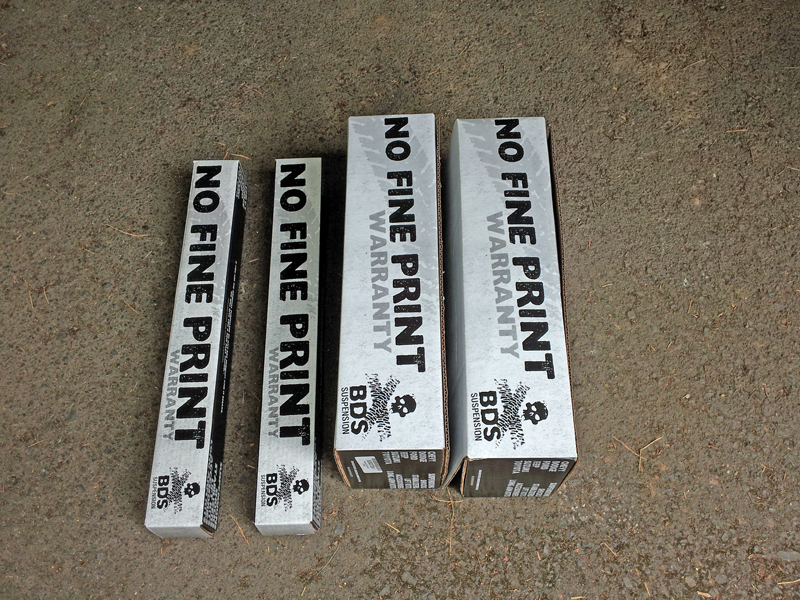 BDS is also known for its "No Fine Print Warranty." If it breaks, they fix it. All of the parts look very well made and feel stout, so I doubt I'll need to take advantage of that warranty. Regardless, it's nice to know its there. Installation is straight forward, and there are comprehensive written instructions. 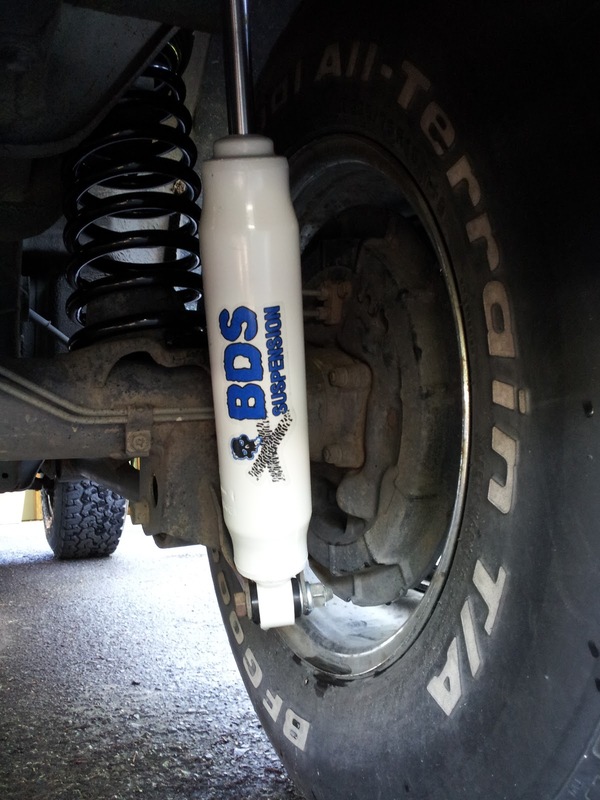 There are two things to note: The rear shocks are painted white, and that included the threaded ends. You'll want to clean these up so it's easier to put the nuts on. Also, I intended to replace the OEM struts with a set of Monroe Sena-Tracs. Unfortunately, the rods on these struts are slightly wider than the OEM units, and the BDS strut extender wouldn't fit over the rod. I opted to reuse the OEM struts instead, and was able to return the unused Monroes. 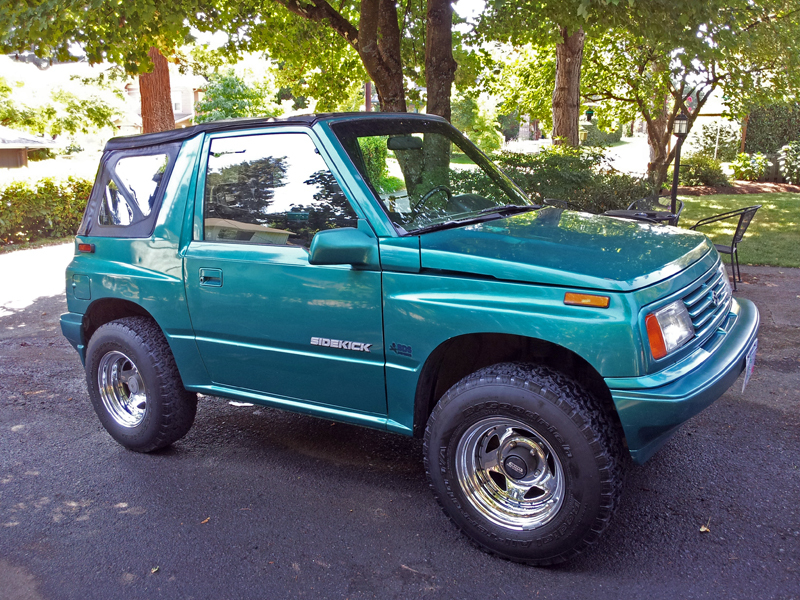 This was the first vehicle I'd lifted, and there was a lot of learning that went on. For instance, I'd never disassembled a set of automatic front locking hubs. 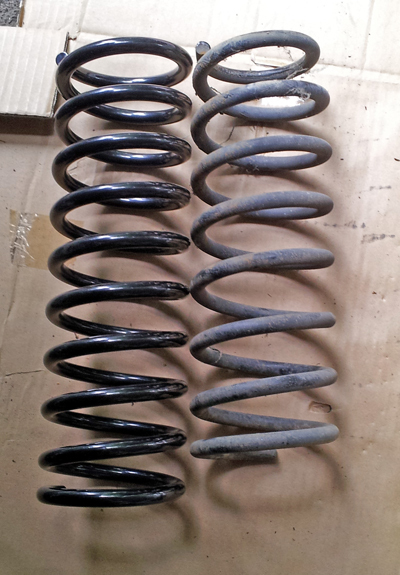 There is some disassembly that has to happen in order to get the taller front springs in (e.g. the axle had to be popped out). Unfortunately, I stripped a screw on the bearing adjuster, and had to use a screw extractor (for the first time) to remove it. I then re-tap the hole, so I bought a tap and die set. A slight delay, but so be it. I also used camber bolts for the first time, which were included in the BDS kit—a very welcome addition. These simple, effective bolts helped to get the vehicle's front end right. A couple of trips to the hardware store later (I had broken a few washers, needed a couple of new bolt), and the lift was done. I have to say I think it looks great. 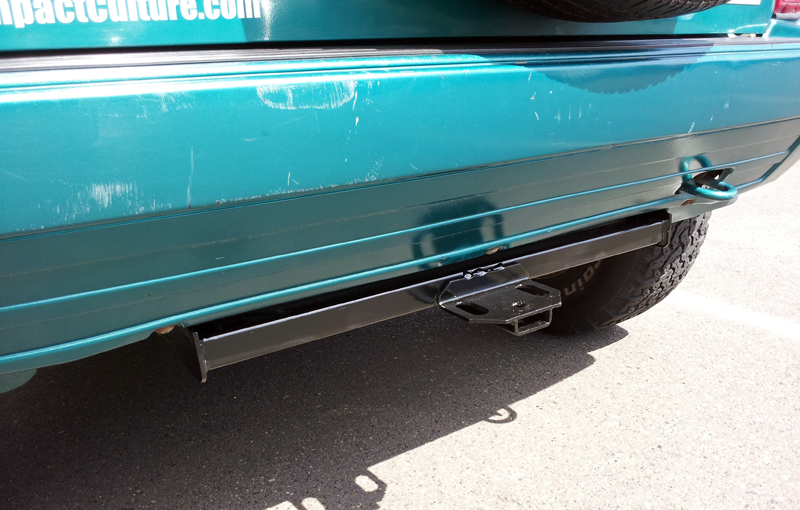 It's not extreme; just a little lift that gives a bit more ground clearance. 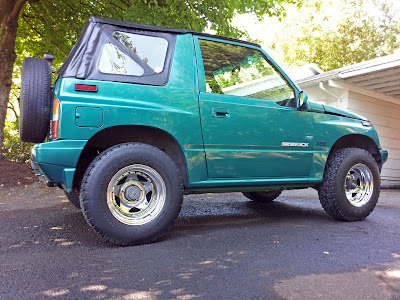 And larger tires look at home on the Sidekick. The ride is noticeably firmer, but not harsh. In fact, the trucklet makes feels more controlled in the corners now. And since the Teal Terror will be getting a new front bumper and a WARN winch in the near future, the extra stiffness might be a welcome thing. It was off to get the vehicle aligned, and it tracks straight and true. Now I can't wait to hit the trails and put the lift to the test. Another modification I did was added a hitch. I found a used Reese Shadow hitch on craigslist for $50. It was a bit rusty, so I removed the rust with a wire brush and Dremel tool, then primed, painted, and installed it. It'll be perfect for hauling leaves to the dump this fall. So there you have it: Lifted and hitched! You really like modifying cars. It's fitted with great equipment possibly for a better performance. Nice work on the modification. You had a pretty hard time beautifying this car but you pulled it through till the end.